Have April Fresh Cleaning Inc handle your junk removal cleaning services. Junk removal can be an overwhelming task and our cleaning professionals at April Fresh Cleaning Inc are the best in South Jersey. Whether we’re hauling junk, doing a foreclosure clean out or an office clean-out, we’re all about safety in our removal services. 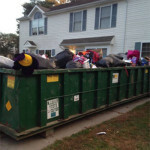 Learn more about our affordable junk removal cleaning services. Please call (856) 534-6754 or email us on our contact us page for free estimates.